Wednesday was a popular day to do some star gazing at the Happiest Place on Earth! Over in Tomorrowland, Joe Jonas of the popular rock trio Jonas Brothers posed for a picture in front of Space Mountain with main squeeze Ashley Greene of “Twilight” fame. 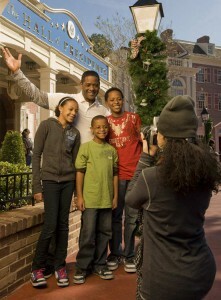 Across the park, TV president Blair Underwood of the NBC drama “The Event” mugged for wife Desiree, along with the couples’ three children, outside of the Hall of Presidents. Photos by Kent Phillips. Copyright Disney.